Pax Financial Planning rounded up their partnership with the Marie Keating Foundation with a final donation of €7,141.97, with Zurich bringing the donation up to €10,000. This money will be used to help people who are undergoing treatment for cancer. Pax Financial Planning, the South Dublin Brokerage, with offices in Newcastle West Co. 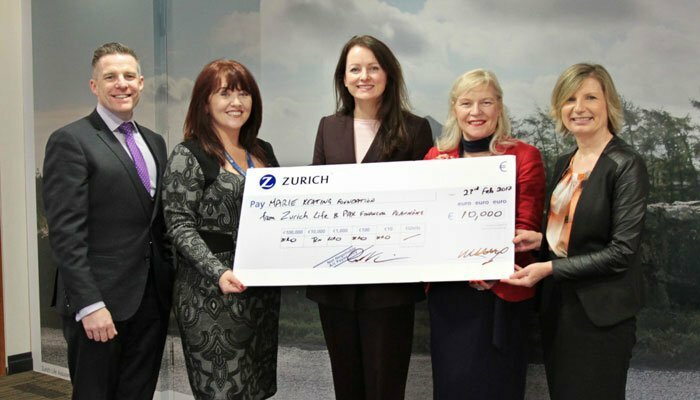 Limerick teamed up with Zurich to present a cheque to the Directors of the Marie Keating Foundation, Linda Keating and Liz Yeates, at the Zurich offices recently. Raising cancer awareness and recognising the importance of protecting against the financial implications of a cancer diagnosis, Pax came up with a clever idea to raise money and awareness for the Foundation. During a campaign that lasted almost 18 months, Pax donated 100% of commission earned on all Zurich Cancer Cover policies established for their clients under the initiative. The Marie Keating Foundation runs extensive support services for cancer sufferers and tying in with a Life Assurance benefit that aims to alleviate these burdens directly, proved a worthy initiative. Paul Merriman, CEO of Pax said he was delighted to be able to give back directly to an organisation such as the Marie Keating Foundation. "As financial advisors, it's our responsibility to ensure our clients are protected against the cost impact of serious illness through benefits such as cancer cover and specified illness. It's been great to link up with such an excellent charity as the Marie Keating Foundation who run important support services, such as the Comfort Fund, helping those that may not have adequate supports in place." Liz Yeates, CEO of the Marie Keating Foundation explained that the money donated from Pax and Zurich would go a long way towards supporting cancer patients. "The average extra spend per month for a cancer patient is €862 due to additional costs for medical fees, travel costs, childcare and household bills. Those who cannot work or can only work a few hours, face an income drop averaging €1,400 per month, or €16,750 per year," Yeates said. In 2016, the Marie Keating Foundation gave out over 525 Comfort Fund grants to families from 22 different counties. "There has been a significant increase in the number of Comfort Fund applications we are receiving due to closure of similar funds for cancer patients. The €10,000 raised will help make a meaningful difference in the lives of 20 to 25 families affected by cancer. Because of this donation, the Foundation will be able to send them Comfort Fund grants, giving them some hope at a very dark time," she added. Ronan Keating reiterated that donations big and small to the Foundation, which was set up in honour of his mother, are playing a vital role in providing support for cancer patients. "We are so grateful for the kind donation of Zurich and Pax customers and colleagues," he said. "Each year, the Marie Keating Foundation helps people who are undergoing treatment for cancer but who are financially struggling. The Comfort Fund has been in existence since 2004 and helps men, women and children from all around the country. In 2016 alone, over 525 families received grants. It is so fitting that Zurich's Cancer Cover is now helping to support families who are in need because of this terrible disease. Thank you for making a difference."